Does the Prairie Dog Stand a Chance? About 90% of the black-footed ferret's diet consists of prairie dogs, and as an animal lover, it is often hard to accept that one animal is only able to exist only at the expense of another animal. Such is the case of the black-footed ferret and the cute prairie dogs, which are cousins to the squirrels in backyards all across America. To make matters worse, the wild ferrets are not the only animals that prey upon the small, burrowing prairie dog. 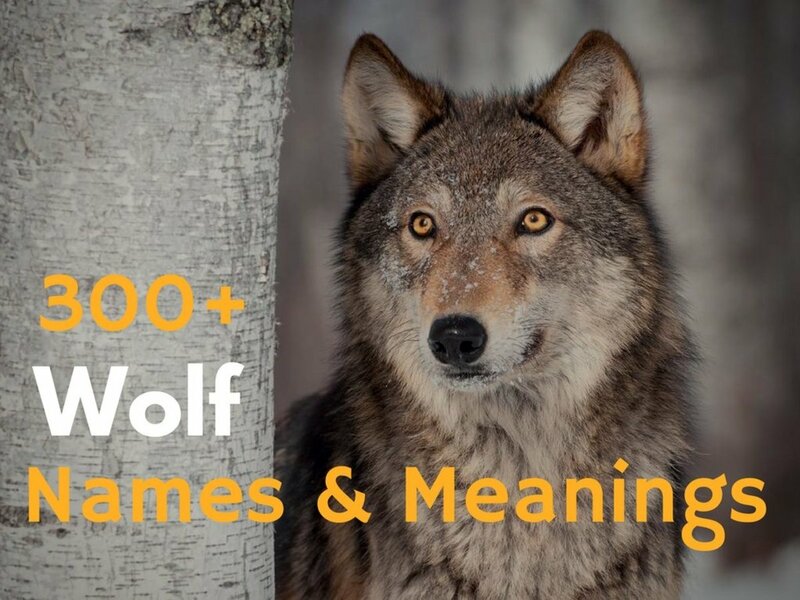 They are also preyed upon by coyotes, bobcats, badgers, golden eagles, and prairie falcons. Then there's disease such as the bubonic plague, which entered North America via rats aboard European ships in the 1800s, spreading quickly through wild mammal populations, including black-tailed prairie dogs of the northern Great Plains. The bubonic plague is still rampant in some areas and when it does strike a colony of prairie dogs, it usually wipes out the entire colony. There are only five species of prairie dogs - black-tailed, white-tailed, Gunnison's, Utah and Mexican prairie dogs. They are only found on the continent of North America. 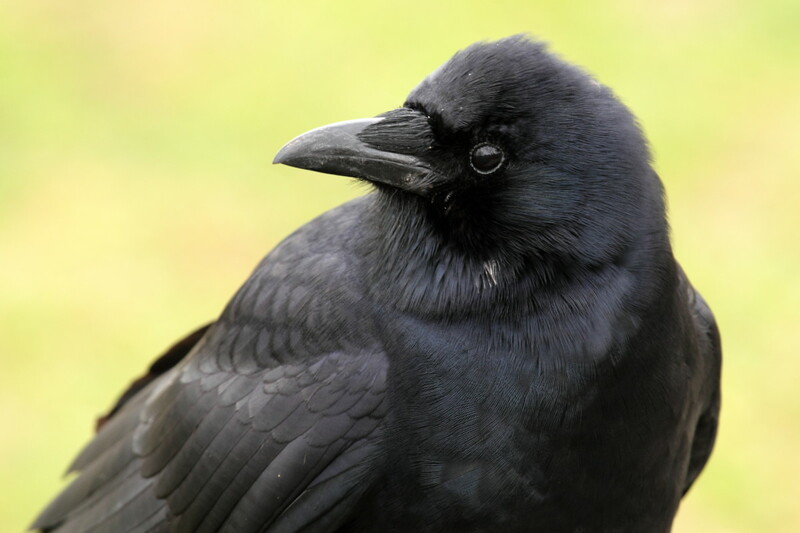 They are very social animals that live in close-knit family groups called "coteries." Coteries will usually contain an adult male, one (or more) adult females and their offspring. The coteries are grouped together into wards (or neighborhoods) and several wards together are referred to as either a colony or a town. Shoot them or save them, hate them or love them, there's little middle ground where prairie dogs are concerned. The government poisons them, developers bulldoze them, aficionados rescue them, while ranchers, complaining that they take the grass from grazing cows' mouths, brand them "prairie rats." Over the past century, prairie dog and black-footed ferret populations in the wild have drastically declined due to habitat loss, poisoning, and devastating outbreaks of sylvatic plague. Between the ranchers and the black-footed ferrets, the prairie dogs of the plains may not have a fighting chance; the ferrets depend upon them almost solely for food and housing, and the ranchers depend upon the cattle with which they compete for forage, so it's difficult to lay the blame in anyone's court. But, the black-footed ferrets are one of the most endangered species on the planet and as recently as the 1970s they were thought to be extinct. In 1981 a colony of the ferrets was discovered in Wyoming, but that colony was almost completely wiped out by canine distemper. Those that survived were rescued for a captive-breeding program, which to date has resulted in over 7,000 young black-footed ferrets. The ferrets kill the prairie dogs and procure their burrowed-tunnel housing as their own. A wild ferret catching its prey, a prairie dog, which is a biological relative of groundhogs, chipmunks, marmots and woodchucks. There are only five species of prairie dogs - black-tailed, white-tailed, Gunnison's, Utah and Mexican. Can the Black-Footed Ferret and the Prairie Dog Both Survive in the Wild? A wild ferret can eat up to about 100 prairie dogs in a single year. According to defenders.org scientists estimate that a healthy population of ferrets would require more than 10,000 acres of prairie dogs in order for them to survive on a long-term basis. Because their habitat has declined over the years, there are very few clusters of prairie dogs that remain today that could meet that criterion. The conservation of any and all healthy prairie dog colonies is essential for the continued existence of the black-footed ferret. 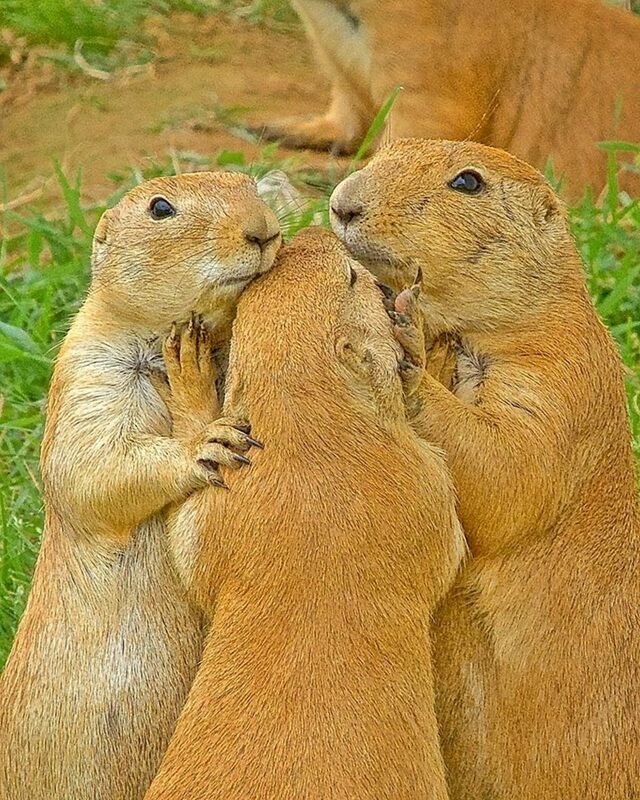 But then, what about the continued existence of the prairie dogs? The prairie dog colonies have been reduced to less than 5% of the area they once occupied, due to habitat loss and interference by some humans, who consider them to be vermin. Defenders of Wildlife, a conservation group established to protect native animals and their habitat, and some of their conservation partners recently relocated hundreds of prairie dogs to a protected spot in the middle of the Thunder Basin National Grassland in eastern Wyoming. The relocation was to keep the animals from being either poisoned or shot by farmers attempting to keep them off their land, and to restore 18,000 acres of prairie dog colonies. 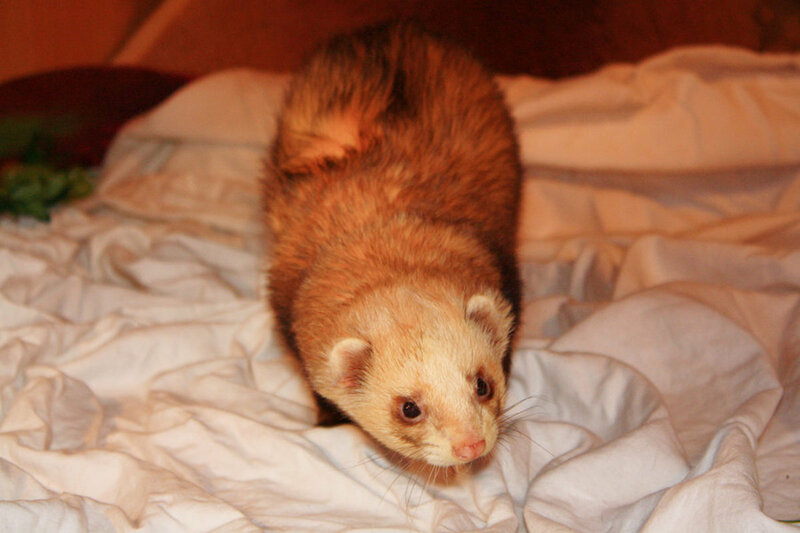 The major difference in black-footed ferrets and pet ferrets are that they are different species (although related). The black-footed ferrets (Mustela nigripes), in fact, are the only ferret species that is native to North America, and they exist in the wild only in or near prairie dog colonies. Domesticated pet ferrets (Mustela putorius furo) descended from European ferrets and they have been domesticated for well over 2,000 years. 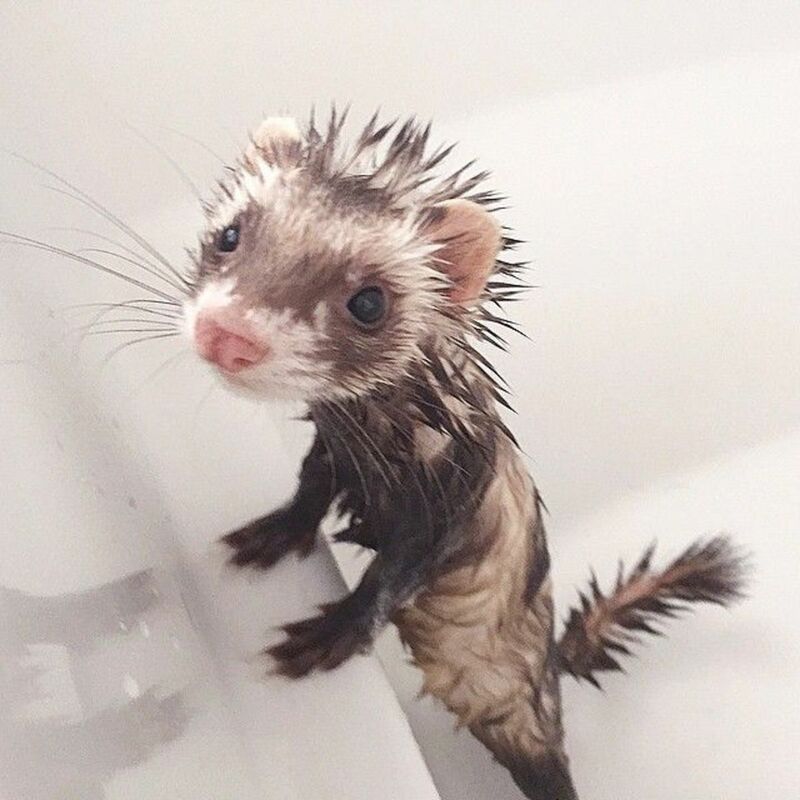 They are unable to exist in the wild, so if you see a ferret in your neighborhood, it is someone's pet that has gotten out of its cage or turned loose in the wild by its owner. Please call your local animal control and let them capture the ferret for adoption. Left alone in the neighborhood, the ferret will most certainly die. 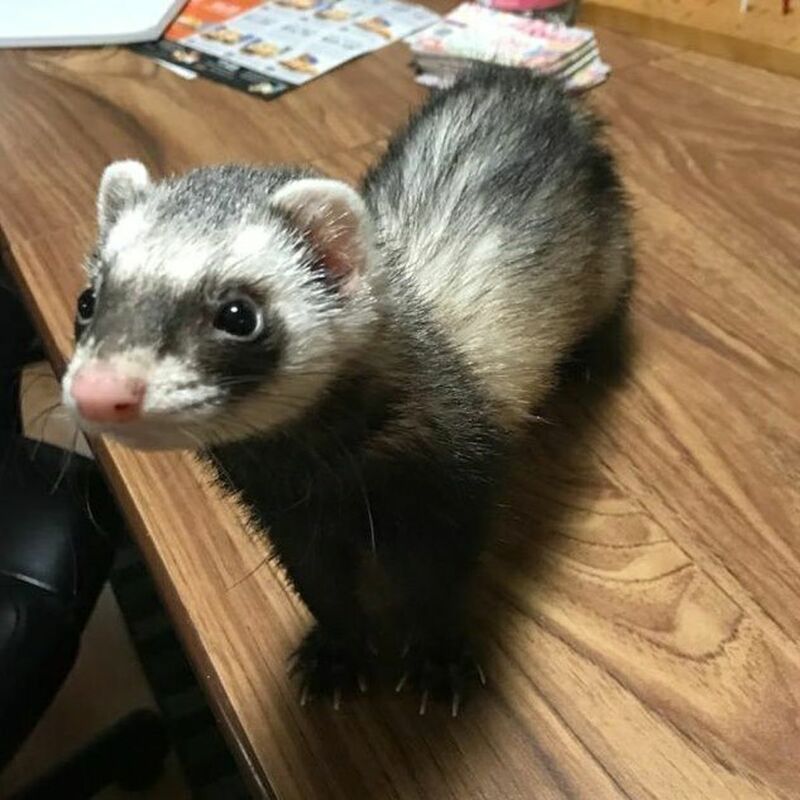 Pet ferrets usually have longer fur than the wild ferrets and they can be many different colors, which can range from white to black and many colors in between but black-footed ferrets are always the same - a tan color throughout the body with black on their feet, mask, and tail tip. 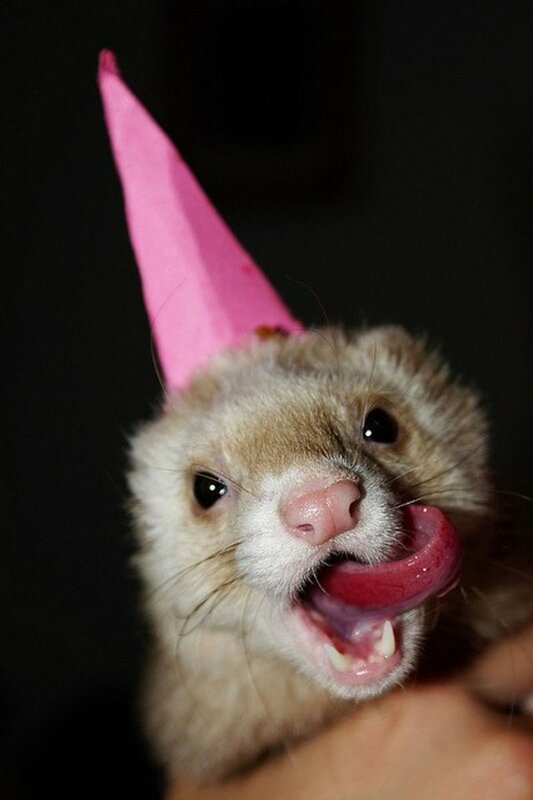 They also have a black nose, but most pet ferrets have a pink nose. 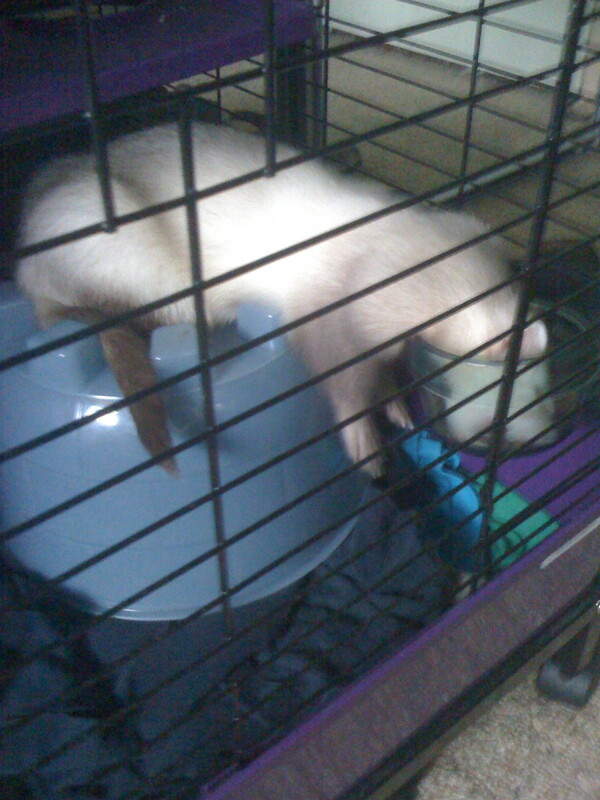 If you own a pet ferret, you have probably noticed that your pet sleeps when you sleep and adjusts pretty much to any schedule you set forth in regard to eating, etc. Black-footed ferrets, however, are normally nocturnal, because the nighttime is a great time to sneak up on a sleeping prairie dog. It is rare to see a black-footed ferret during the daytime. Black-footed ferrets are loners and are very territorial, ready to do whatever is necessary to keep other black-footed ferrets out of their hunting grounds. 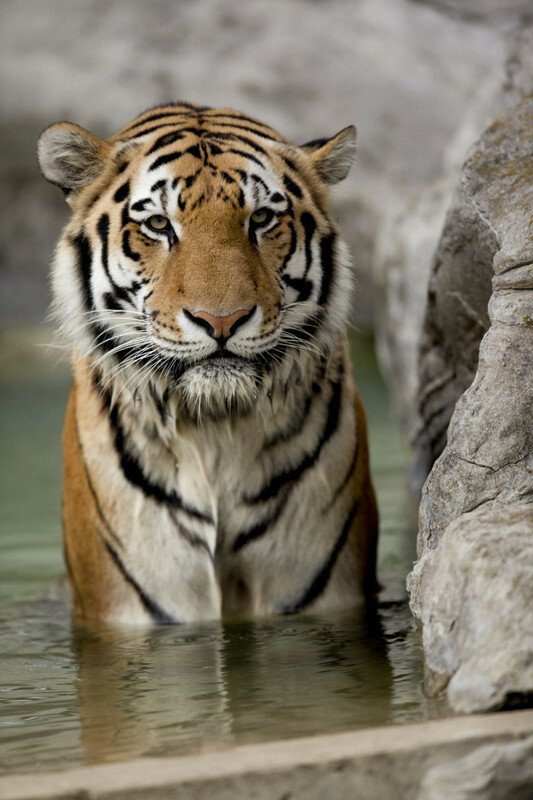 The only time you will see two of them together is during their breeding season. If you've ever owned a pet ferret, you already know that these lovable bandits love to play with each other, although during the times they don't appear to be getting along they are actually just "play fighting". 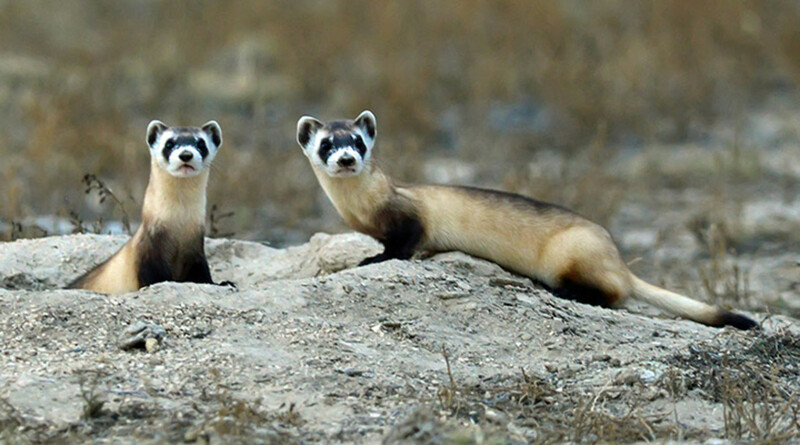 If you see two black-footed ferrets fighting, it's the real thing.